Cruise line aiming to grow market following launch of Celebrity Edge. Shake-up takes effect from March 1. 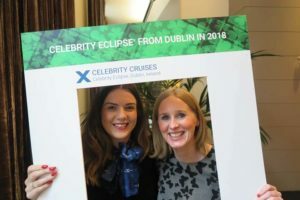 Celebrity Cruises is looking for a new Regional Sales Manager to cover Ireland and Scotland to replace Mandy Burrie. Ms Burrie, who took over the Irish job in September 2016, has been promoted to Strategic Manager Retail North in Britain with the cruise line. She will also look after the Travel Network Group (TTNG) and Advantage Travel Partnership. The company said her role will be to focus on identifying and nurturing new partners. The new Regional Sales Manager for Ireland will report to Mandy Burrie, who will in turn report to Head of Sales Nicola McNeish. Celebrity is further looking to boost business following the launch of Celebrity Edge. Sister ship Celebrity Apex will launch in Southampton in 2020. Celebrity Edge will offer a full season of sailings in the eastern Mediterranean and Adriatic in summer 2020. She will join Apex, as well as Celebrity Silhouette, Celebrity Constellation, Celebrity Reflection and Celebrity Infinity in Europe for the season. The cruise line is also looking for a new Regional Manager for Britain’s south east after the promotion of Jonny Peat. The revamped sales team structure comes into effect on March 1.